OSHA requires that every forklift operator complete forklift training as specified in Standard 1910.178(l). To meet these requirements, A-1 Forklift Certification offers online forklift training, on-site forklift training in Los Angeles and surrounding areas. Perfect for: Individuals seeking to earn a better living by getting forklift certified. How it works: Our EASY four-step process offers you the convenience of working at your own pace. Take the test as many times as necessary to pass. This course includes an easy-to-follow video that explains the OSHA powered industrial truck requirements and the elements of forklift safety. It also includes a PowerPoint presentation to serve as a learning aid. Getting your certificate: When you finish the test, simply print out your certificate directly from home. We will mail you your wallet card within 3-5 days. Perfect for: Beginning forklift students and expert operators seeking to earn a better living by getting or renewing their forklift certification. Learn the basics of forklift safety and operation. Experience the unique opportunity to use one of our forklifts and learn, hands-on the necessary skills to improve your career options. Our knowledgeable instructors have established a program that accommodates all learning styles, making the process not only easy, but FUN! How it works: We offer hands-on training is offered at our Anaheim facility, conveniently located to provide forklift training throughout Orange, Los Angeles and Riverside counties. Getting your certificate: Complete the training within a few hours and walk away with their certificate and operator card, in hand, the very same day. 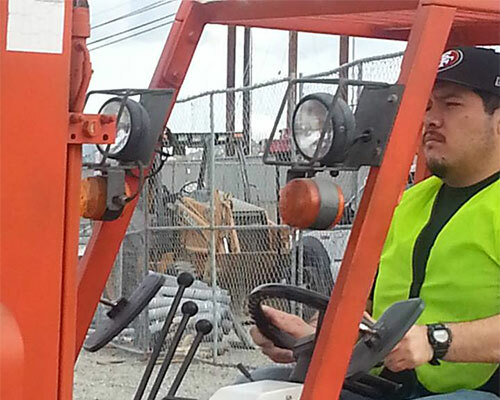 Pictured: Hands-on forklift training student Jose Quiroz. Price: Special group prices, all inclusive. Get a price, call Donna at 1-877-922-5438. Perfect for: Companies seeking to comply with OSHA Standard CFR 1910.178. How it works: This flexible onsite forklift training option is custom-tailored to fit your business’ specific needs. It fulfills all OSHA compliance requirements and we customize our onsite forklift courses to coordinate with your organization's size and schedule guidelines. A-1 Forklift concentrates on providing the best training options available, providing all materials and completing the entire documentation process for you. Getting your certificate: We issue new and renewed certificates onsite. Perfect for: Businesses seeking a cost-effective option for providing on-going, OSHA certified, forklift training to their employees. Offered in English and Spanish. How it works: A-1 Forklift provides all required materials for you to develop your own in-house forklift certification program. Following all OSHA forklift training guidelines, this high-quality program enables you to train and certify as many employees as needed, allowing you to do so in any time frame that you require. 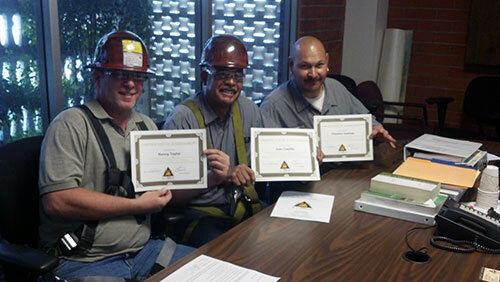 The engaging safety video reinforces all topics in the training. Getting your certificate: This course includes all testing and certification documents. 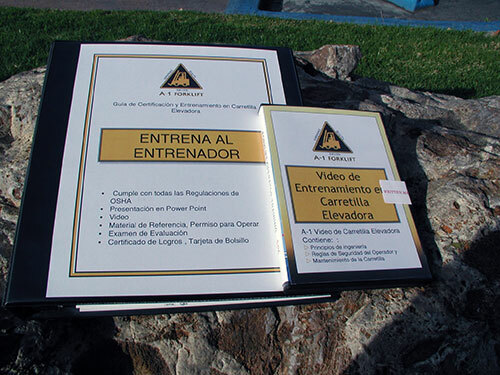 Pictured: Our latest offering, Train the Trainer en Español. Price: Aerial scissor lift inside $125, outside $150; aerial articulating boom inside $135; outside $165. Perfect for: Companies needing to comply with OSHA requirements for all types of aerial type lifts (scissor lifts, extensible boom platforms, articulating boom platforms, etc.). A-1 forklift ensures your full compliance in the training, evaluation and authorization as required by OSHA. How it works: We come to your facility, and as with all of our services, concentrate on providing the best training options available, providing all materials and completing the entire documentation process for you. 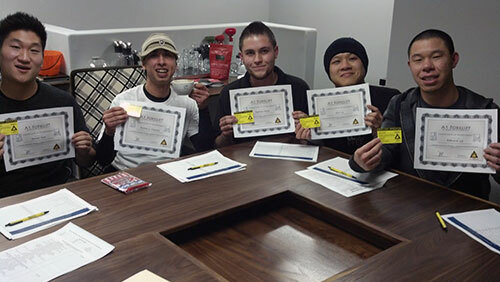 Getting your certificate: We hand out certificates and wallet cards at the end of the course. Pictured: Aerial Boom Lift Training students at Siemens. Price: Get a price, call Donna at 1-877-922-5438. 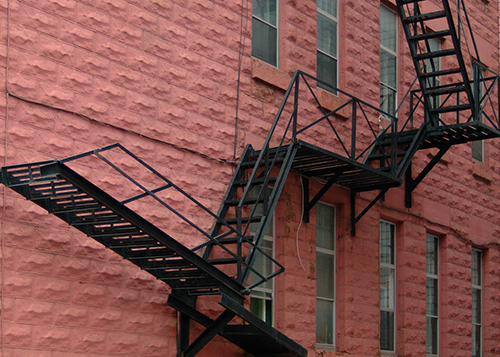 Perfect for: Companies seeking to comply with Cal-OSHA requirements and have a written fire prevention plan in place. Also for employers who provide portable fire extinguishers for employee use and must provide an educational program to familiarize employees with the general principles of fire extinguisher use and the hazards involved with incipient stage fire fighting. How it works: We offer plans and portable fire extinguisher training, guiding you through the entire process of developing and implementing your organization's plan, training your employees in extinguisher use and establishing full OSHA compliance. Getting your certificate: We provide all necessary paperwork that confirms your company went through fire prevention training.